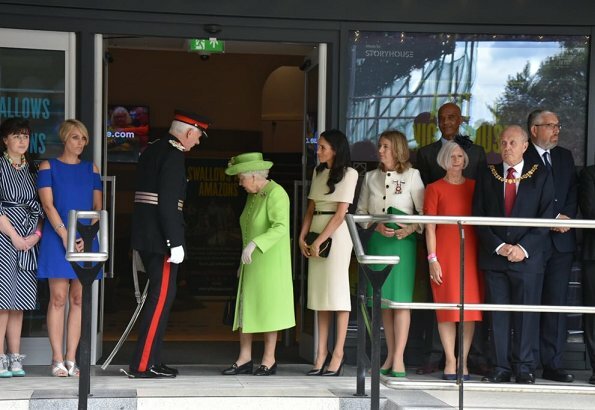 On June 14, 2018, Queen Elizabeth II, accompanied by the Duchess of Sussex visited Cheshire. 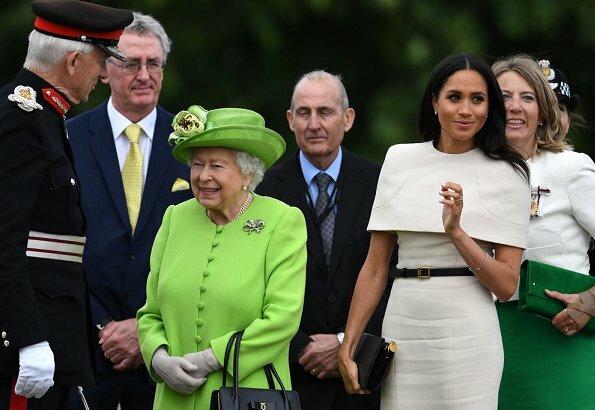 The Duchess of Sussex and this is her first engagement with the Queen. During the visit the pair opened a road bridge in Widnes and visit The Storyhouse and Town Hall in Chester. 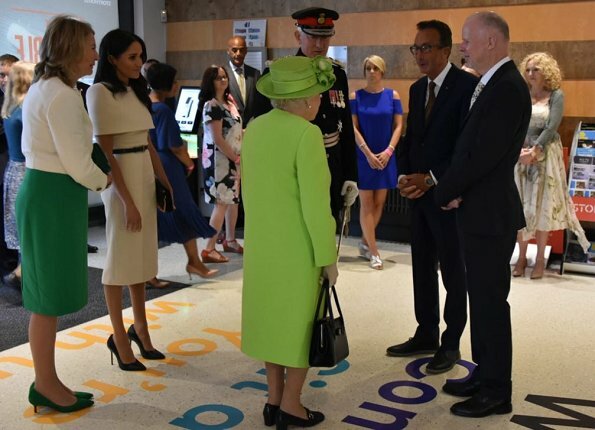 After the Queen and Duchess unveil the plaque at Storyhouse, they attended a lunch at Chester Town Hall with local politicians and civic dignitaries. Next, The Queen and The Duchess met members of the public in Chester City Centre as they walked to Chester Town Hall. 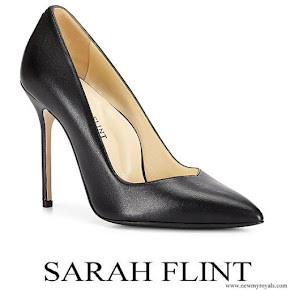 Duchess Meghan is wearing bespoke Givenchy and Sarah Flint Perfect shoes for today’s events in Cheshire. Love how they were their size. They both look lovely and very much themselves. 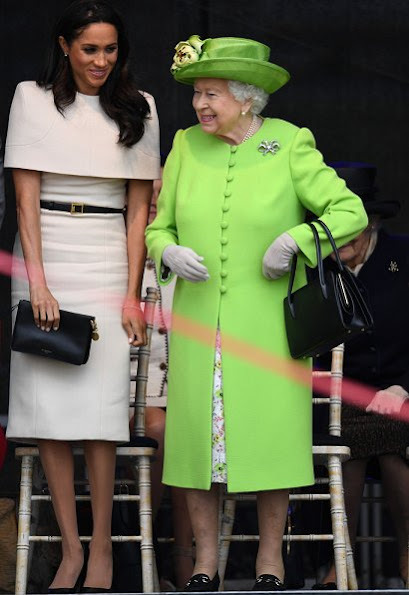 The Queen is impeccable and recognizable in her bright stand-out color and the new Duchess' ensemble is simple and elegant. They do not compete with each other and complement each other. 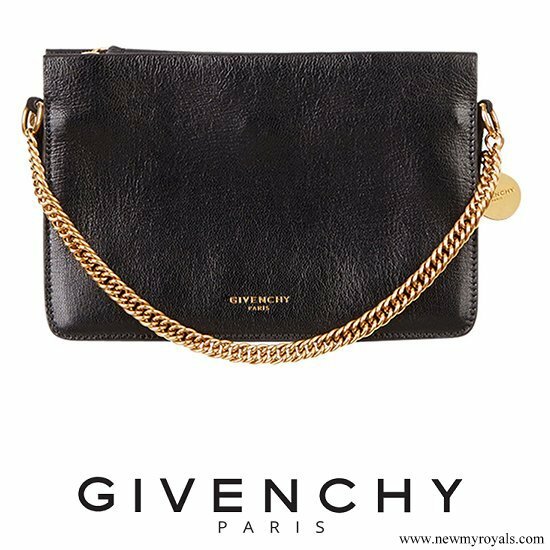 Givenchy may be her "go to" in the future. "They do not compete with each other"...? How could Meghan - or anyone else - compete with the Queen?? The colors they are wearing, Coralie, the colors of their outfits do not clash or compete. They complement and enhance each other. Pine, I think I misunderstood you - sorry. Now I see what you mean! That's OK. I agree that no one can compete with the Queen. But they can be complement her. The Queen looks lovely. Meghan's dress is nice but where is her hat? Hats are not standard for day events. The Queen continues to wear them. Catherine does at times. But usually they do not unless it is a formal state affair or visit. Camillia rarely wears hats. She is dressed impecably. Even in the UK exists less formal occasions like this. But I'm pretty sure Meghan will wear a hat for Royal Ascot. Towards the end of her life even Diana had stopped wearing hats "everywhere" as she was pretty much required to do in the early days - the rules had been relaxed a bit. 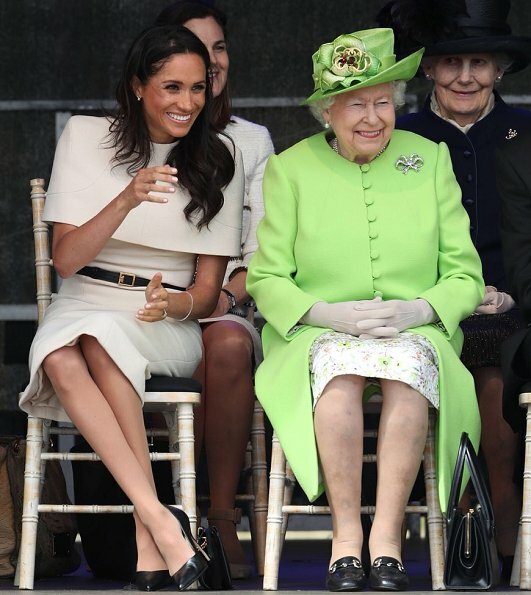 And I know we shouldn't critique body-types because it’s a bit unfair (we can only work with what God gave us) but I've noticed that Meghan does not have the best pair of gams. She has what my mom would have called “bird legs” – long and scrawny (very thin) with no shape or curviness to them. Add to that the requirement for hosiery (stockings) when on official royal duty and a skin tone that most manufactures do not cater to (and I’m speaking from personal experience on that), and she has a bit of a tricky situation. But she and her team of helpers (whoever they may be) have been managing quite well at pulling her look together. Lord knows I’m not wishing her majesty into the great beyond but I suspect that once the Queen passes away, the hosiery rule will be relaxed again and they’ll go back to it being “optional” as long as you’re well-groomed with a discreet hemline. I agree as for Meghans much too thin legs! This is a fashion blog. Be soft. Do not let the world make you hard. My question about the missing hat was not meant as a offense or critic. I was just courious because I remember that the Duchess of Cambridge has worn a hat on her first official solo trip with the Queen back in 2012. At first I just thought there's too much negativity. Now I agree with what you said, which is well formulated. Meghan is pretty but she has got generally few muscles. Maybe it's nice to take a break from etiquette school to visit a gym. 😉 Finally the members of the royal family are very enthusiastic about sports. Au contraire, mes amis... DoS has well muscled legs, and body from decades of yoga and other physical activities. No amount of muscle building exercises can change those skinny calves. She’ll need to learn how to dress where folks ignore what can’t be changed. Unsure of what is meant by “...generally few muscles.” Au contraire mes amis; the DoS does NOT have “skinny legs,” she has great gams. Hers is a healthy, well muscled body, acquired from decades-long yoga and other physical activities. No amount of muscle building exercise would change the disproportionate leg-to-calf ratio to give her legs like Lady Diana or DoCm. It's true. She has beautifully muscled and well disciplined legs from yoga. Look at the second to last picture. Her calf muscles are higher set than most. This can be seen when she wears to-the-knee outfits. And when she walks away from the camera, as in the engagement photo shoot at Kensington. Also, the last photo with the Queen here shows her terrific figure in the well-fitted Givenchy. The protocol for royal day trips leaves wearing a hat as optional. The Queen always wears one but it is not unusual for a member of the royal family not to wear a hat in the Queen's presence at a day event. There are loads of photographs of various royals (Anne, Sophie, etc) who accompanied her Majesty on a day trip not wearing a hat. Meghan has acquired the perfect "Duchess Slant"! Yes Monty, very much so, it is her major plus, I would say. Not only fashion outfit etc are important, body language is essential, it is what people remember most. I like the relaxed posture of the Duchess. She really looks nice. The idea of the cape dress is very interesting, though her shoulders look wide and a bit heavy. But in general a good outfit. Wow, Queen and New-Dutshess together and a lot of hearty laugh! Nice to see this lightness of Her Majesty that's unusual and we can see this rarely during officinal appointments. Both Ladies have wonderful dresses. It didn't occur to me, how extremely thin her legs are. Anyway she is an real charming and beauty woman! They look both lovely. Love hoe much there is smiling and laughing in these pics. 2 beautés: une a 92 ans et l'autre 36 ans. Elles sont toutes les deux pimpantes et souriantes dans leur tenue parfaite. Un vent de fraîcheur souffle sur la Cour d'Angleterre. I like to see the smile on the Queen! She looks wonderful and happy. Meghan looks elegant as well. It's only the beginning of years of learning from the Queen and her duties. So far, she is doing very well. Personally, I don't think she needs a hat. The new duchess has been instructed to wear stockings by command of Her Majesty. I'm not sure if that is good or bad. 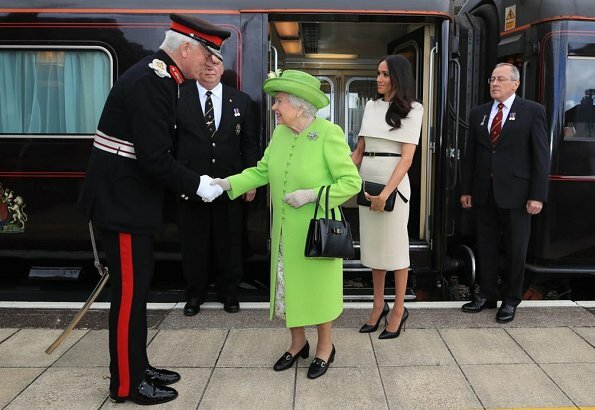 I'm sorry I can't point to a specific source but I do believe there was some sort of "rules" (for lack of a better word) to given to the ladies of the BRF to provide some guidance on how to dress properly while on official royal duty. This included discrete hemlines (the Duchess of Cambridge was wearing some really short dresses at one point), no bare shoulders in church and at functions such as Ascot etc., and hosiery. Now, I'm pretty sure if someone shows up to a function breaking one or more of these "requests" the Queen is not going to have them locked away in the Tower of London :-) but most of women of the BRF have been following these guidelines over the past couple/few years *and* if you really pay attention and study various news photos, etc. you can definitely see a"shift" in how everyone is dressing now compared to then. It's not a HUGE thing, just showing respect for the monarch that's all. I love Queen E's cheeky smile. And the colour of her handmade ensemble is fresh and funny. Amazing Lady - bless her! Full marks to both ladies for elegance and, as someone pointed out above, for wearing outfits that compliment each other beautifully. The Queen looks lovely as she always does. I like the Duchess' dress style and simplicity of design, but feel that in certain photos, that cape looks a little odd, and no fault of hers, of course. Face on, it looks boxy and angular on the shoulders; sometimes from the side angle it looks too tightly wrapped around her upper arms and shoulders. 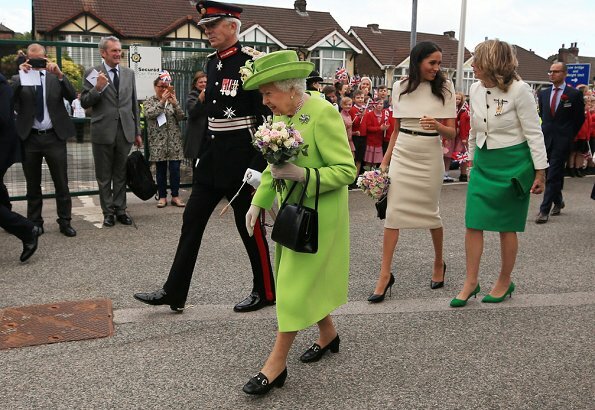 I like that she picked a simple colour and does not interfere with the Queen's style at all. A small simple hat would have completed the look to perfection. All in all, an excellent outfit. The duchess has lost a lot of weight, and I'm more convinced now that this has affected the fit of her recent outfits including her daytime wedding dress. Also in video footage of todays event, she is constantly touching her hair and moving it away from her face. Not a good thing when having to shake peoples hands a lot. Again a hat or some head gear might have helped with this. They both look wonderful! I love the easy dynamic between them. Great job, DofS. MEGAN MOOI kleef. Maar haar kapsel is te lang en ze zit voortdurend haar haren achteruit te duwen. Dan weer links. Dan weer rechts. Maakt.me zenuwachtig. 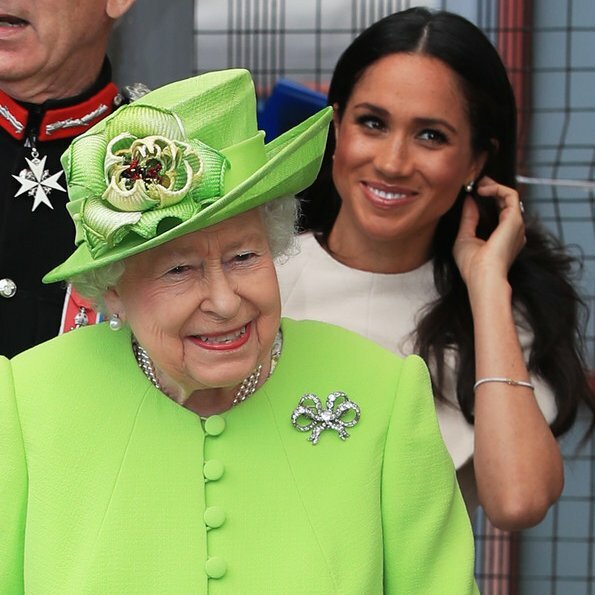 the queen is the only woman I know that looks good in lime green. Meghan looks lovely! Perfect outfit! She already is an outstanding royalty I live her! Queen Elizabeth as always looks fantastic.Dss Meghan 's dress is very nice, just wondering if this little cape is a bit stiff and don't let her move freely. Both Ladies are looking great the interaction between them is nice to see. I can't say I like the cape. On certain pictures she looks constrained by it, on the others she looks bulky. The dress itself wrinkles. It mught not be a problem for anyone else, but she is one of the most often photographed people now, that is why it might be better to choose clothes which would look perfect from any angle and stay fresh and neat no matter what. 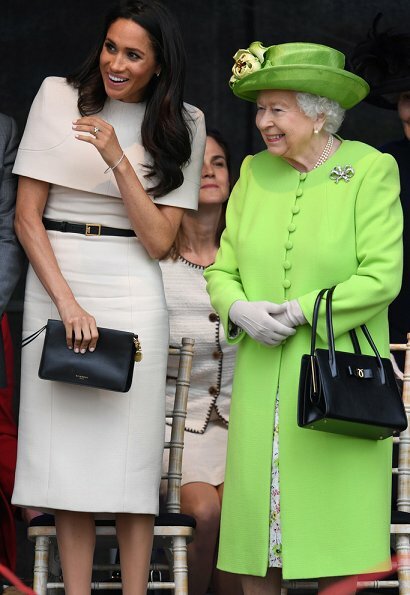 Nice to see them laugh, i think the Queen is taking time to instruct the new Duchess her new role. Both ladies look perfect in their own style. MM looks impecable, beautiful silhouette, perfect length and interesting mock cape around the shoulders, I personally would've liked to see a more adventurous ,shoe, belt & bag color, maybe a metallic, grey or lilac, however I understand the need to choose safe colors on these firsts months, when she is being looked up thru a loupe. The Queen looks radiant, and there seems to be good chemistry between these women. The shoulders on Meghan's dress look a bit confining; however, that didn't prevent her from playing with her hair, as per usual. Straggly hair, as per usual. I will be glad when these capes go away. She would have looked good with a blazer on top similar to the dress Diana used to wear. Shoulder problems crop up again, lol -- this time a strange, highly exaggerated, boxy effect that looks decidedly odd. 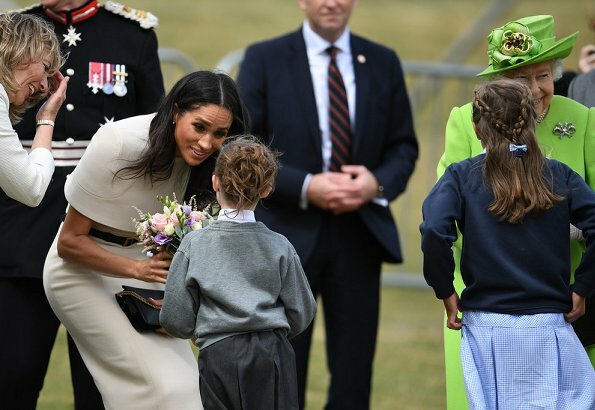 But, no major faux pas and I guess loose hair is here to stay (at least until more of our long-haired royal ladies decide to favor updos as the rule rather than the exception). 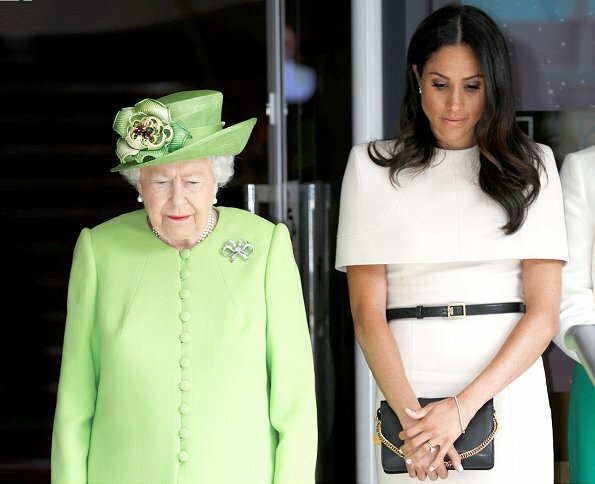 I'm happy for Meghan that she is receiving such strong encouragement from the queen. You find the right words. 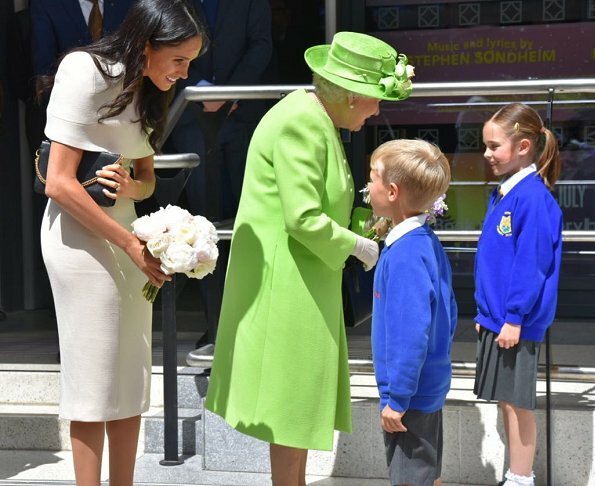 I agree to some comments that the cape-thing on Meghans dress looks a bit weird, but anyway she looks elegant here. I find it a pity that she did not wear that style before she married. Since her wedding she didn't wear inappropriate dresses, I think. The Queen is wonderful as always. The queen always looks good and young for her age. Meghan's dress is very elegant and she look good, the length of her dress is good because as someone else has mentioned, her legs are very thin and she looks better in dresses below her knees or in midis. It looks like they both get along very well. Meghan also looks very nice and chic. Don't know if the wind messed up her hair while sitting next to the queen? I don't like that she still looks totally (over-)acting from time to time, all that touching in the own face and hair.. The queen looks fabulous here. I think she has become more relaxed lately which is great to see. Love HM outfit too. Bright colours look nice on her. Meghans dress is ok not a fan of the cape though. It looks to restricting to me. I do wish though that Meghan would do something with her hair. It always looks so untidy and messy to me which IMO detracts from the whole outfit. 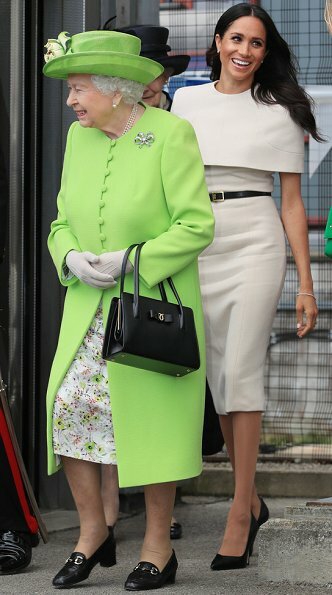 Both the Queen and the Duchess look wonderful. I’m a fan of Meghan’s dress! 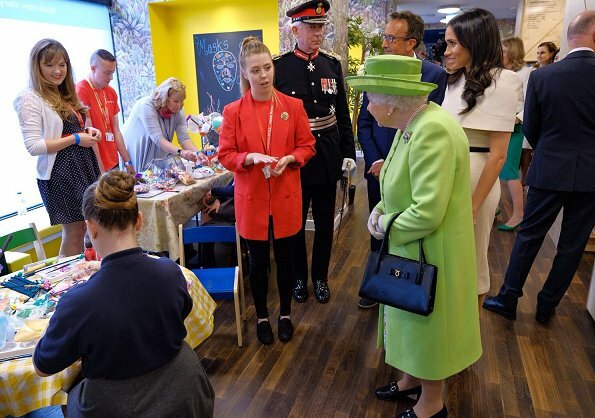 About the hat: take a cue from HMQ's Lady-in-waiting: No hat. This was one of those occassions, where hats are not required. 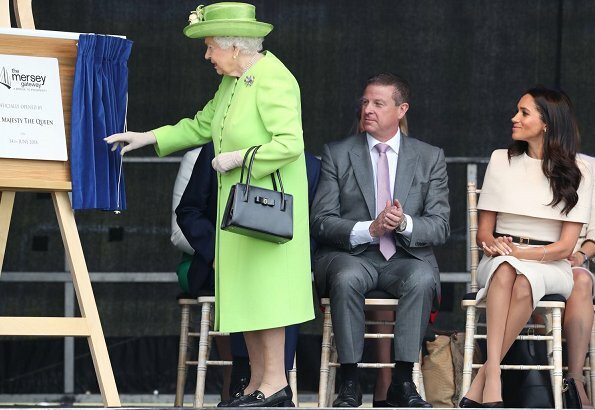 As Her Majesty pointed out, several times in the past, she wears hats always to be seen. But the focus here should be on the lovely women having a marvelous time together, and wearing chic, beautiful outfits. Wouldn't you agree? I love Meghan's dress from the waist down. But the faux cape seems to me a designer's reinvention of the wheel. A jewel neck and cap sleeves would have been predictable, perhaps, but much better looking. The Queen is absolutely beaming - she must be very fond of Meghan. A lovely appearance from both ladies, each faithful to their particular style. Wunderschöne Bilder, beide Damen verstehen sich gut und die Bilder bestätigen diese ausgelassene und entspannte Atmosphäre. 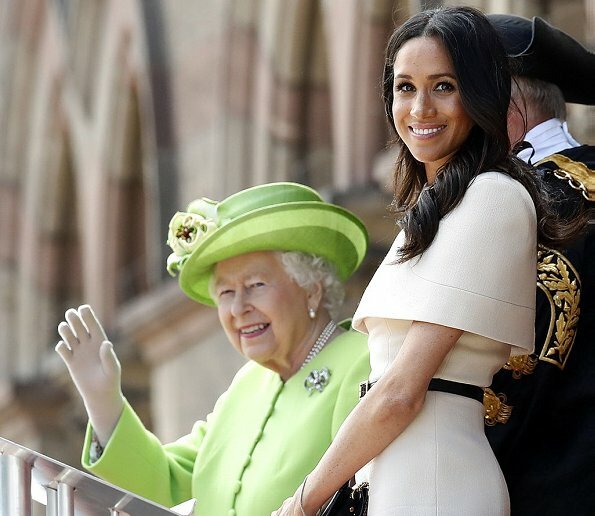 Die Kleidung ist ebenfalls sehr gut abgestimmt, die Queen ist schick wie immer und Meghan schick in zurückhaltend beige - wunderschön! I think both ladies look very good. The duchess's outfit is especially nice - sleek, modern and classy and she carries it very well. I think her hairstyle was perhaps a wrong choice. I would go for tie-ups when doing outdoor events, because you can never be sure what the weather will do. Its good to see the Queen smile, it's a great fashion accessory! The green is a little bit of a surprise after seeing her in blue over the weekend, but refreshing. Kapsel opgestoken zou veel keuriger zijn. Kleding van Megan is super. Is Meghan the new Jacqueline Kennedy? 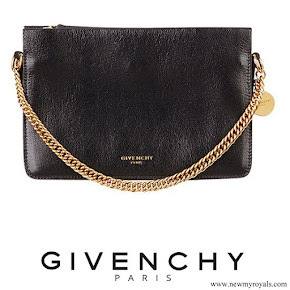 It is wonderful to see her in Givenchy. Real haute couture.